It's back to the future for the Oracle database world. The wild world of 1990's client-server technology are long gone, and Oracle shops are re-consolidating their data resources. Back in the 1980's, the mainframe was the rule, and now that the one-server-one-application paradigm has proven too expensive (increased staff), they are now moving back to the centralized architectures of their ancestors. Sun - The largest Sun Fire server has 72 processors, 144 threads, and runs at 1.8 GHz, and the new "Galaxy" servers will be even more powerful. IBM - IBM offers the IBM System x3950, that allows processors to be added (up to 32 CPU's). This allows Oracle shops to scale-up within the same server. There are also compelling performance benefits to server consolidation. Left is an example of a server consolidation where a set of three IBM P590 Regatta class servers (each with 18 CPU's and 128 gig of RAM) replaced several hundred minicomputers. Using IBM's virtualization tools, Oracle instances can be partitioned into logical partitions (LPAR's), while still maintaining the ability for critical tasks to use all CPU resources for super-fast Oracle parallel query. The new IBM P690 servers are even more powerful, supporting 128 CPU's and over a terabyte of RAM, with all of the processing needs of a midsized corporation nestled within a single server where the resources can be transparently shared. What Oracle hardware architecture is best? At Oracle Openworld 2015, Oracle officially embraced the 2nd age of mainframe computing and the rise of the virtual machine, via their commitment to vmware for Oracle. Andrew Holdsworth (Senior Director of the Oracle Real World Performance Group) gave a presentation titled Current Trends in database tuning, (user cboracle, password=oraclec6). Andrew notes that 99% of OLTP applications have multiple instances per host machine, and that it's easy to keep an instance from hogging the CPU by using the cpu_count as a processor fence (you can set cpu_count=2 on a 32 CPU machine, and the instance will only use two processors, and that you can use the resource_manager_cpu_allocation to control processing resources. At the OS level, you can also control resources with the CPU affinity features, and you can adjust the priority of individual processes with the Linux/UNIX ?nice? command, which changes the dispatching priority for server tasks. One server, one application - The one server, one application advocates note that this architecture has no single point of failure, and a spike in one application will not adversely affect other systems. As a tradeoff for the guaranteed isolation, no single point of failure, the one server, one application approach has obviously higher costs as additional administrative and DBA time is required for the redundant management of software patches. Even more significant, we see the extra cost of over-allocating RAM and CPU to accommodate spikes in usage and the loss of parallel operations which require an SMP server with multiple CPU's. Grid computing - Advocates of Grid computing have racks of re-usable "blades", tiny computers (4 CPU's, 4 gig RAM) which can be strung together to form a scalable grid. This architecture is the hallmark of the Oracle 11g Grid database. The problem with Grid servers is that they have redundant copies of the OS and RDBMS software to manage, and they must have the software pre-installed before it can be genned-into Oracle. See Oracle's Ellison speaks on grid architectures for details. Server Consolidation - Old-timers (like me! ), remember the benefits of being able to manage all of your applications within a central location, and we advocate a return to the good ole days of the mainframe, back before cheap minicomputers heralded the debacle that was called "the age of client server computing". Fallacy: Single point of failure - Properly configured, none of these architectures suffers any a single point of failure. Today's hardware has fully-redundant everything, and with geographical data replication (Streams, Dark Fiber RAC), hardware errors are becoming quite rare. Fallacy: Rogue applications can "hog" a centralized computer - Also, the segmentation of large computers into smaller, fully isolated slices had been done successfully for decades, and the system administrator has the ability to "fence" RAM and dedicate CPU's to specific applications. (Using CPU affinity, the "nice" command, setting cpu_count and resource_manager_cpu_allocation). Also, vmware solutions provide a similar solution for mixed OS environments. The Oracle hardware architecture that you choose is all-about minimizing cost and risk. Management favors a Oracle database hardware architecture that favors minimum human intervention, those where the hardware does the load balancing. Oracle estimates that human error is the predominant cause of unplanned outages, a compelling reason to adopt hardware architectures that minimize redundancy copies of the software, and the associated DBA overhead. Also, the redundant software issue with grid computing has been minimized with the 11g "instant provisioning" feature. Running the Oracle installer over-and-over is tedious and time-consuming, and Oracle has solved this issue by allowing for instant provisioning of new servers. 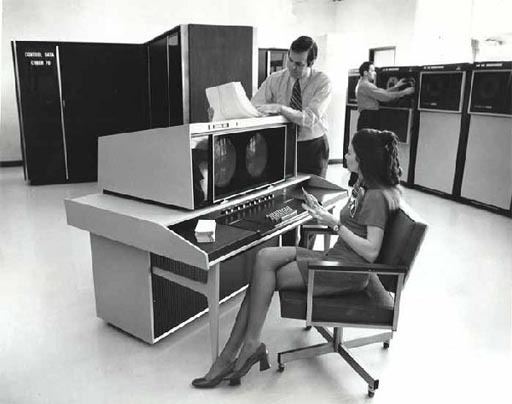 In the beginning there was the mainframe, a huge monolithic computer that could support all of the data processing needs of large corporations. 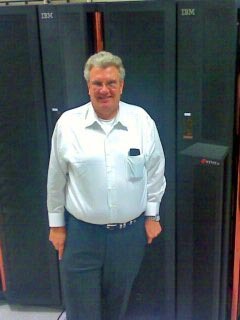 These massive servers cost millions of dollars, and the hardware was very expensive, relative to the system management costs. Is the mainframe coming back? A team of five DBA's could manage an entire corporation. However, this was not to last. As the age of client server computing arrived, Oracle DBA staff quadrupled to accommodate the increased management overhead. Today we recognize that the movement towards client server computing was an economic decision. Management was enticed by the low costs, and they made a conscious decision to abandon the proven single-server approach in favor of a distributed network of smaller computers. In the 1990's we saw a huge movement away from the glass house towards the new "minicomputers", small UNIX servers that cost a tiny fraction of the mainframes. Data processing managers began doubling the size of their machine rooms, adding acres of real-estate to accommodate hundreds of these itty-bitty computers. With the one-server, one-application approach, sys-admin and DBA staff multiplied, as staff struggled to maintain hundreds of glorified PC's. I remember when my shop got their first HP minicomputer for $30k, an unbelievable bargain in a world of four million dollar mainframes. (I also remember that the Oracle license cost was nearly as much as the hardware costs!). It's no surprise that Oracle server consolidation is being recommended by the major hardware vendors (HP, UNISYS, Sun), and the market for their 32-CPU and 64-CPU mega servers has been good. Best of all, server consolidation allows for better utilization of processing resources, and Oracle parallel query can be employed to a much larger degree. See my Intel UNISYS webcast on Oracle server consolidation for more details. Better reliability - Mainframe-like processors can be configured to avoid the single-point-of-failure problem. Vendors note that fault-tolerant components can be used to make a single server as reliable as a distributed scheme. They also note that Oracle's own failover tools (Data Guard and Oracle Streams) can make systems resilient to hardware failure. Better on-demand CPU and RAM allocation - Critics say that the mainframe-like UNIX behemoths provide internal resource allocation that will be more efficient than a distributed model. 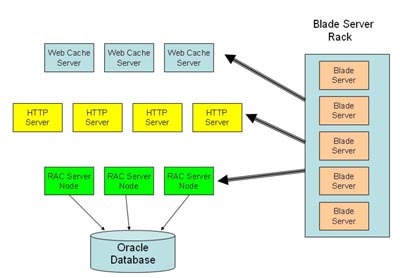 Better scalability - Critics noted that the server blade approach to grid computing allocated independent units of dyadic or quadratic processors, making Oracle Parallel Query less efficient. A 32-CPU monolith will be able to process a large Oracle table far faster than a grid of small independent processors. Server consolidation is bad for the DBA job market because one of the main reasons for consolidation hardware resources is the savings from reducing Oracle DBA staff. A typical shop can save a million dollars a year by removing a dozen DBA's. There are two main approaches to scalability in Oracle. The first is the "scale up" approach. If tasks can run independently of one another, then Real Application Clusters can distribute them to different nodes. This permits you to achieve scale up. In essence, scale up is more processes run through the database in the same amount of time. The number of nodes used, however, depends upon the purpose of the system. If processes can run faster, then the system accomplishes more work. The parallel execution feature, for example, permits scale up. With parallel execution, a system might maintain the same response time if the data queried increased tenfold, or if more users could be served. Real Application Clusters without the parallel execution feature also provides scale up, but does this by running the same query sequentially on different nodes.